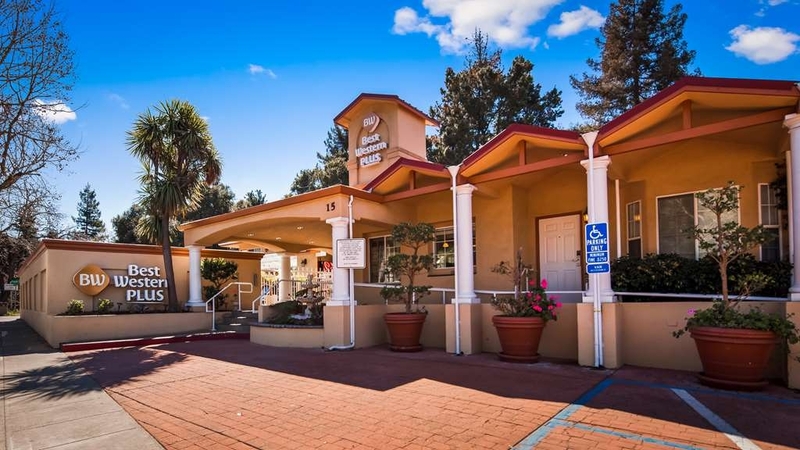 The Best Western Plus Riviera is ideally located in the center of Menlo Park. Come and experience our hotel near the major tourist attractions. Best price guaranteed and exclusive deals. 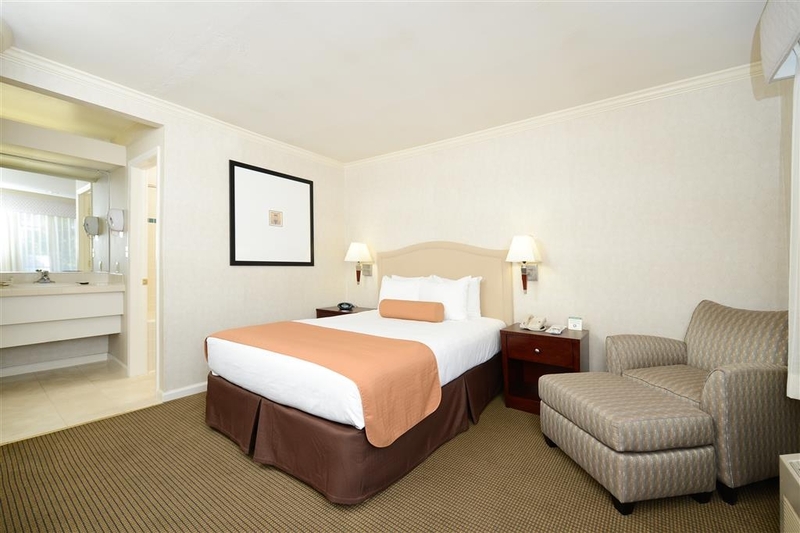 Located near Stanford University and close to Palo Alto, there’s no better location than this Menlo Park hotel. Stanford University, Stanford Hospital, and a host of other top destinations are in the neighborhood of our Menlo Park hotel. Football games, shopping, and university events are all big draws for many guests. However, there’s no need to overpay for a top location and the best amenities. 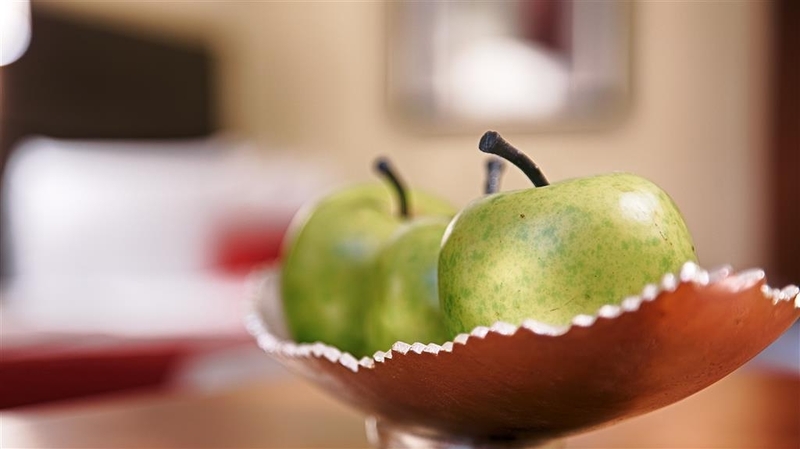 Our Menlo Park hotel boasts well-appointed rooms, fantastic decor, and perks like a complimentary full breakfast spread. Leave the most important meal of the day to us. 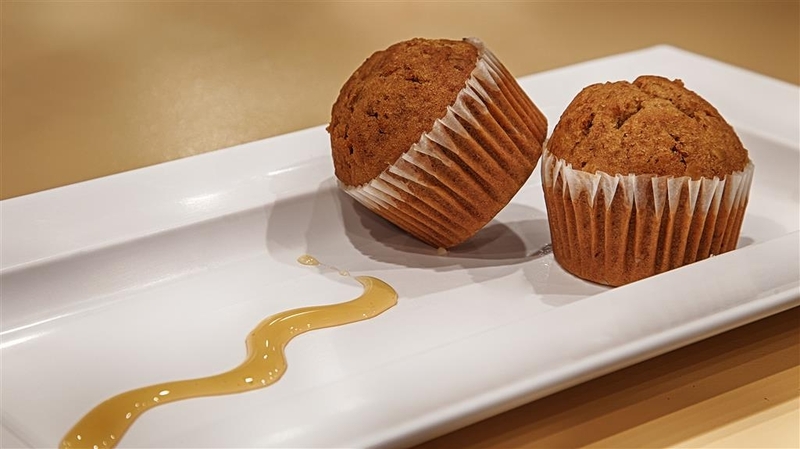 The daily buffet includes stacks of hot waffles, breads, hot breakfast meat, hot eggs, other hot items, yogurt, hot and cold cereals, sweet pastries and fresh fruits. Complete the meal with endless chilled juices and 100% Arabica coffee. We also regularly host business travelers. 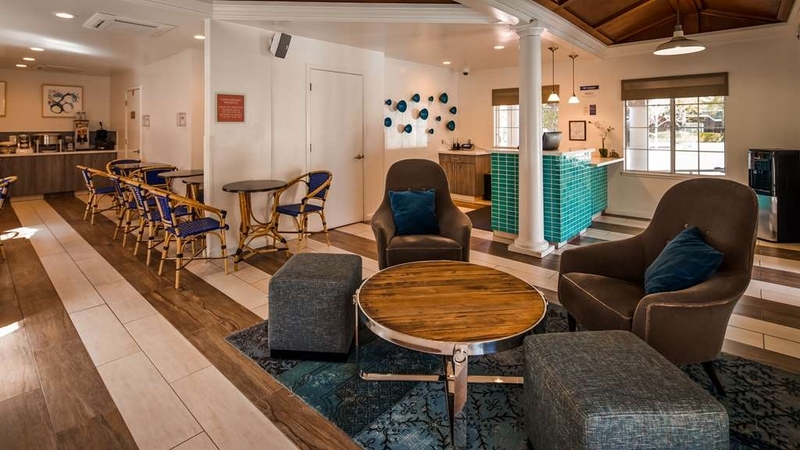 This Menlo Park hotel is a favorite of employees from US Geological Survey, Stanford University, and Stanford Hospital. It’s easy to commute from our prime location. Business travelers also adore the touches of home and accessibility to other area hot spots. Every guest is treated to the best service, quality and accommodations. We also keep our prices competitive to ensure an excellent getaway, whether it’s for business or pleasure. Friendly staff members are happy to help with recommendations and any guest needs. 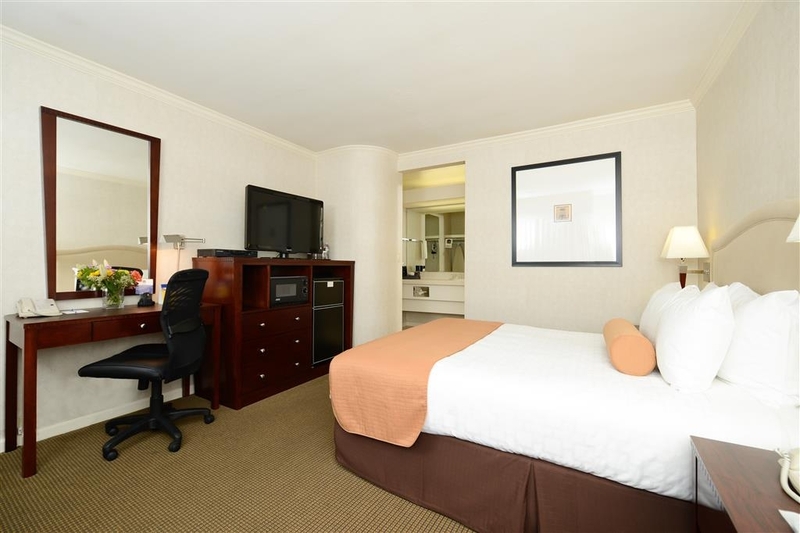 Enjoy your next vacation or business trip stress-free at our Menlo Park hotel. There’s a reason so many people return: our unbeatable prices and location combined with world-class service. Ensure your next trip goes off without a hitch. 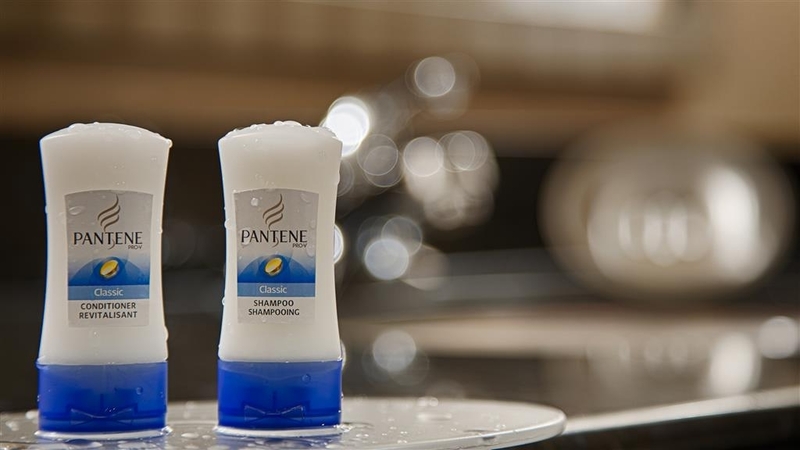 We’re committed to making your vacation flawless. Reserve your upcoming stay at Best Western Plus Riviera and rest assured you’ll be taken care of! Enjoy your stay. Nice enough motel. They could not get me a remote that worked properly for the TV. They were helpful but it took the desk clerk five trips to my room and I finally just had him turn it off. Continental breakfast was average for a motel. I have stayed in this hotel multiple times since 2015 and the proximity to Stanford can't be beat. It is close to the train station and a bit loud which might be a problem for some. In 2015 for over 6 months the hot tub was “cracked”. The website did not mention that fact, and in 2015 when I suggested that should have been noted the front desk was unapologetic and dismissive. This trip this week the staff was lovely and informed me the hot tub was filled in and no longer available. The website advertises as having a hot tub available still as of today. I just think people should be aware as it's sonewhat difficult to find hotels with hot tubs in that area. For me, it was a bummer (I went 3 other times where it was working) but I will continue to book here for the proximity to Stanford. Michael the manager was warm, caring and friendly. He made a difficult trip to Stanford a little easier. Rooms were comfortable and breakfast was fresh and delicious. Close to hospital and many restaurants. Thank you Michael! "Handy Location Just Minutes from Stanford University: Clean Motel, Friendly Service"
We stayed at this property during my daughter's Stanford visit and found the location to be unbeatable. Our room (king) was spacious and clean, nice linens and plenty of towels. I appreciated the microwave and refrigerator in the room because there are so many great places to eat nearby and we always had leftovers. The Stanford Shopping Center was literally a couple blocks up the road, easily walkable. It was a little chilly for us to take advantage of the beautiful outdoor pool the weekend we were there, but it looked like a great outdoor space. The breakfast was fresh and hot and the buffet eggs weren't slimy or runny. There were large varieties of fresh fruit, pastries and beverages. The parking lot is underground and was well lit and clean (be aware of the 7 foot clearance max and some of the stalls are 6 foot). 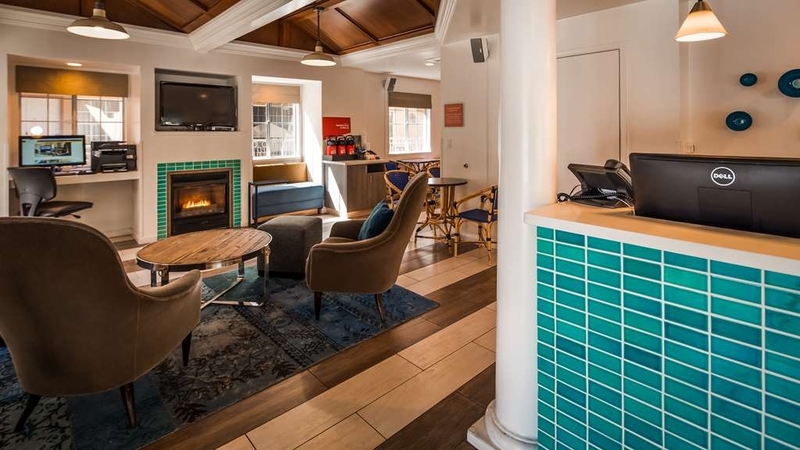 I've already made my reservations for our Admit Weekend in April and anticipate staying there frequently once my daughter is a full time student. being thee during business trip. The hotel is ok, the breakfast is very average, but the people who work there are very kind and willing to help. Room is ok and clean. I think it is a bit over-rated for what it offers. Great location and nice, clean rooms. The staff though is what really stood out. The manager, Michael, is extremely friendly and has a keen focus on making sure everyone is happy and has what they need. The location is great too as you can walk to all that Palo Alto has to offer. It is a bit loud as it is off a busy street but not terrible and they give you ear plugs if needed. I would stay here again for sure. "Convenient location for a good price"
Spent a few nights here and. to me, it is a really good option depending on what you want to spend. The staff was very helpful and courteous. The room was clean and comfortable and a good size. Nice amenities were included in the room - clean remote, soaps, shampoo, bottle of water, ear plugs, conditioner, lotion, and I am sure I missed something. The hotel is a little difficult to get into in that you may drive right by the entrance. I would also suggest asking for a 2nd floor room - on the first floor I could hear the person above me walking around (wasn't that bothersome to me though). The location is super convenient to many things in the area and there is parking 'underneath' the hotel. 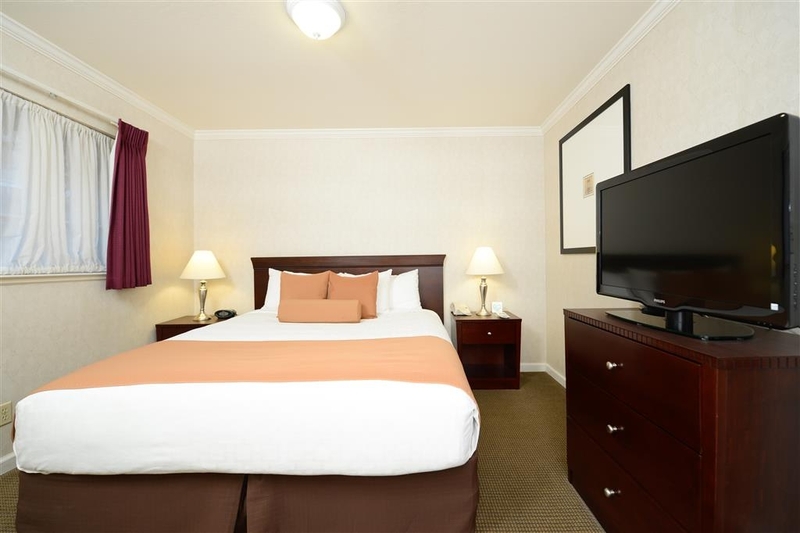 "Solid Palo Alto Area Hotel"
This Best Western is a solid example of a no-frills, clean and comfortable hotel. I stayed in a first floor room and was initially worried about the road noise. It turns out that this hotel is quieter than the much more expensive Hotel Nia! I did hear some neighbors to the rear when using the bathroom, but otherwise not bad at all. Certainly nothing interrupted my sleep. 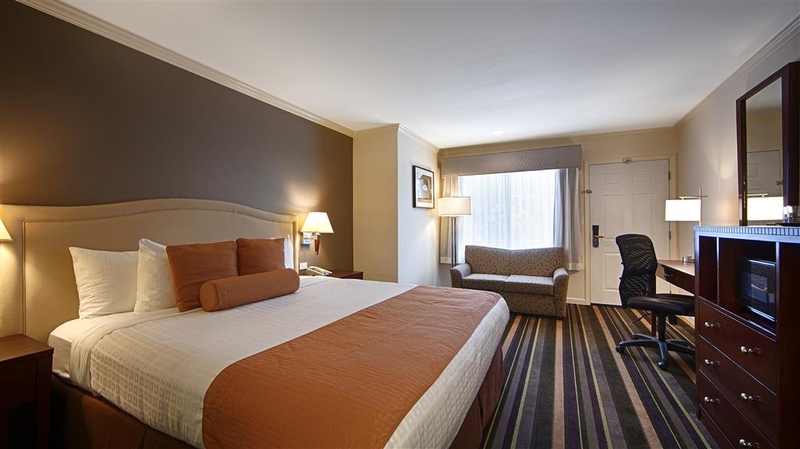 The bed was comfortable (if not exactly a Westin-level mattress), the room was super clean and adequately appointed (if you are looking for luxury, look elsewhere), everything worked like it should (including the mini-fridge), and the staff was responsive and very nice. What more could you ask for a hotel? 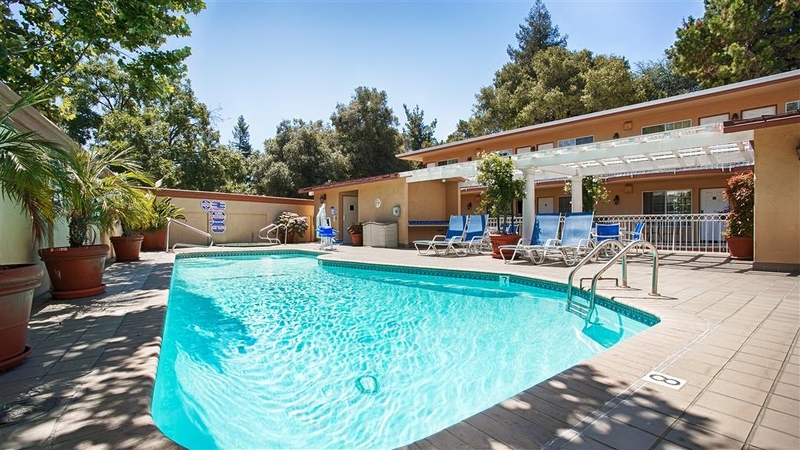 To be clear, it is right on a main road, so you won't mistake this for some getaway, but if you need a good hotel to stay at in the Palo Alto/Menlo Park area, you can't go wrong especially for the price. 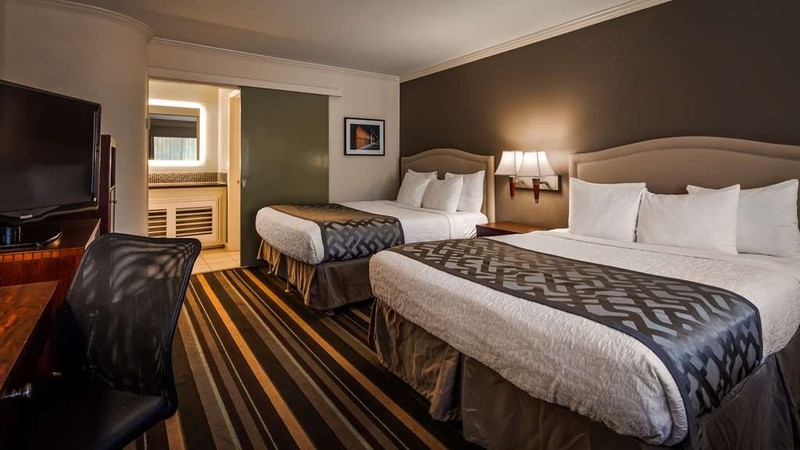 This hotel is in a superb location next to Stanford shopping center, the university and local transportation. Its accommodations are clean and practical. Our room had good thermostatically controlled heating and good interior lighting. The bed was comfortable. The room was provided with nice amenities. The breakfast area is small but is restocked frequently. Being located on a main thoroughfare and near the light rail, traffic and train noise are to be expected. We so enjoy staying at this chain. At this location we have started to get to know some of the staff. Beth is a real sweetheart. She is so professional, yet friendly and personable. She is one of the reasons we keep coming back. Give that woman a raise!! "Worst experience ever in my travel history"
Unfriendly staff. I wasn't informed that my check out was at 11.00 am (I highlighted during booking that I will check out by 6pm) during Check-In. Suddenly the front desk person calls at 12 noon and asks me to check out in 10 mins. In a very unprofessional way. I stood ground, and so was willing to pay one more night. Irrespective of it I got pushed out in an hour. Worst ever experience. Would never recommend this to anyone. "No front desk staff present for check in or check out"
Weirdest experience ever. No front desk person was present even though I pre checked in and let them know I'd be checking in between 6-8pm. It was 8:05pm. Another man was waiting as well. It took 10 mns. for him to show up. I had almost left. There were issues in our room like the AC unit didn't have a constant fan so you could hear all the noise, TV was unplugged, clock radio was unplugged and wrong time. Just weird. 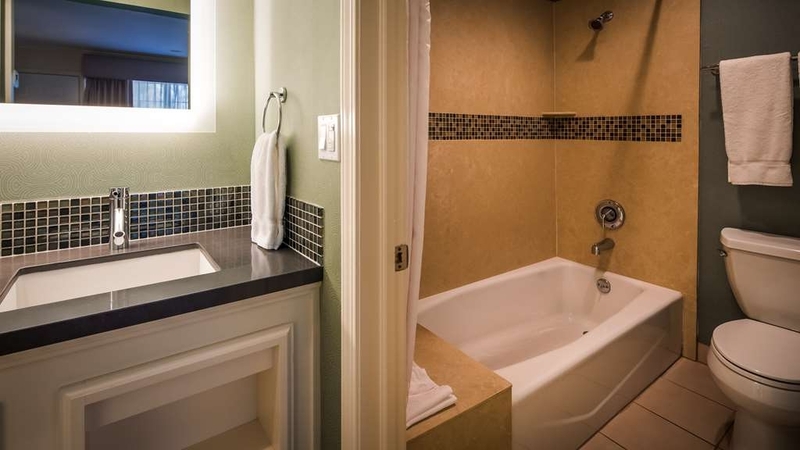 "Does not look much like the pictures"
As other reviewers have already pointed out, this is more a motel than a hotel. When you open the door to your pretty small room, you are greeted by the sight of earplugs on the bedside table (because the motel/hotel is so close to the roadside). Despite the warm weather I did not see anyone use the pool while I was there - likely because it is just too close to the major highway. The room was clean enough and the bathroom OK, but it felt like a sixty dollar motel, not a $250+ a night hotel (what I was actually paying). Breakfast was awful (again, OK at $60 a night, less so for $250+). The guy at reception was nice, but the whole feel of the place, at that price, is wrong. We were in town for a medical appt. at Stanford. This hotel was very convenient and less expensive that nearby options. But once there, we were floored. The staff was very attentive and friendly. The breakfast was nice, the rooms clean and comfy. It's a little treasure. Also, it's near shops and restaurants. It's near a train route, but it wasn't loud, actually charming. We enjoyed our stay totally while hubby was patient at Stanford Hospital. Especially helpful was Yadira who went the extra mile as we attempted to get on the wi fi. Great breakfast, going-away snack, smiling front desk personnel and location. "Excellent hotel close to everything"
Super clean hotel with friendly helpful staff that will go out of their way to make it a more pleasant stay.There is the Stanford shopping center really close by as well as light rail and city bus services.Plenty of available jogging/running paths close by as there is a couple of parks near.Going to watch the Stanford games is convenient as well.The only thing I had a problem with was I took my lifted truck and all the parking although spacious,it is definitely not made for modified vehicles. Acceptable, clean motel, conveniently located, good price for this very expensive area of the country. Carpeting needs to be replaced, no toilet paper holder, good water pressure, front desk staff just ok but housekeeping cheerful despite being understaffed. Second floor rooms are cleaned after 3:30 pm depending on your room number. Noisy because it's on Camino Real but they appropriately leave earplugs on the nightstand. You won't be disappointed if you adjust your expectations. Great place. This was our second year going to a Standford / Notre Dame football game with two other family's.We had three rooms. Great location walking distant to game ,shops and restaurants. Breakfast was good , staff was pleasant and rooms clean. We will be back. I stayed here for a week in October while in the area on business. Pros: friendly staff, clean and spacious room, good internet, close to amenities in Stanford shopping centre Cons: located on busy road, nearby train line is quite noisy, no bar/lounge/restaraunt area for evenings Overall I had a very pleasant stay. Light sleepers may be affected by noise from the train but I got used to it very quickly. "Notes Dame vs Stanford Game"
My husband and I checked in after 11pm dr bing from San Diego County for the Notre Dame Stanford game. Paras checked us in and was there during breakfast and he was so nice. He reassured us if we needed anything or needed us to change our room after we got in there to just let him know. We had a small problem with the mattress but didn't want to bother him and it wasn't a huge deal to us. He just wanted to let them know for the new guests. Paras wanted to be sure our stay was comfortable and was super friendly. He assured us in the morning he wanted our stay to be the best even though we stayed with a Best Western free night. He was super genuine and made this hotel stay that much better. "Awesome staff and very nice hotel!" The staff were so nice and friendly. Our room was very clean and nicely decorated. The breakfast was good, with a wide variety of foods (bagels, waffles, eggs, sausage, cereal, fruit, etc). We will stay here again! This is my third stay at this hotel. Their best price over the last two months for a cancelable king bed has been $159. When I see this rate on the night we go to Stanford Cancer Center, I always reserve this hotel first. I make it a point to check in as early as possible. Ground floor rooms have renovated. Super clean nice rooms. Very comfortable bed, soft towels, comfy perfect pillows. Great tv with HBO & Cinemax. 2nd floor not done yet. You really want ground floor. Get there late you might be stuck on the 2nd floor. Monday - Thursday 3 hour happy hour free wine beer food. Free great buffet breakfast. 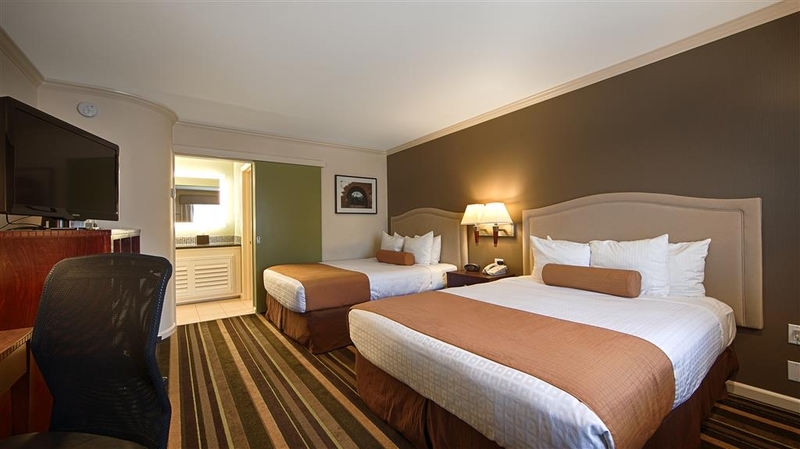 5 star value when you can get $159 room with king size bed. "Best Western poor customer service"
This best western hotell is considered Very Very poor. Very poor water pressure. hair in the clean towels, bathtub didnt drain, staff did not care, and manager is unethical. They do not care and use terminology that we can not define to justify unethical activety. "Very Clean Rooms & Property"
Ended up at this hotel after a hotel nearby didn't have the room available that we booked. We were very happy to be moved to this Best Western. While we did not utilize the pool area, our room was directly above it and provided a good view. It was extremely clean and offered lots of seating. The room itself had comfortable beds, a TV, ample room in the mini-fridge and a large bathroom that was also very clean. I would recommend staying here! Especially if you plan to attend a Stanford game, as we did, since it is in walking distance. It may be because it was in Palo Alto, but we were paying too much because it was the only one available close to our daughter as we faced mandatory evacuations from the Santa Rosa fires. Probably better than your average motel with very helpful staff. Toilet did not work on arrival. Had this not been reported? Great location with under ground parking. Older building that has been updated. 2 patio chairs and table by front door of room. Close to El Camino Real so traffic noise in daytime quiet at night. Lots of bath sink counter space. Clean Friendly comfortable hotel. Morning breakfast was outstanding. Great hotel highly recommend. Internet is very good. In room coffee. comfortable beds. Close to shopping and restaurants. Covered parking with elevators. 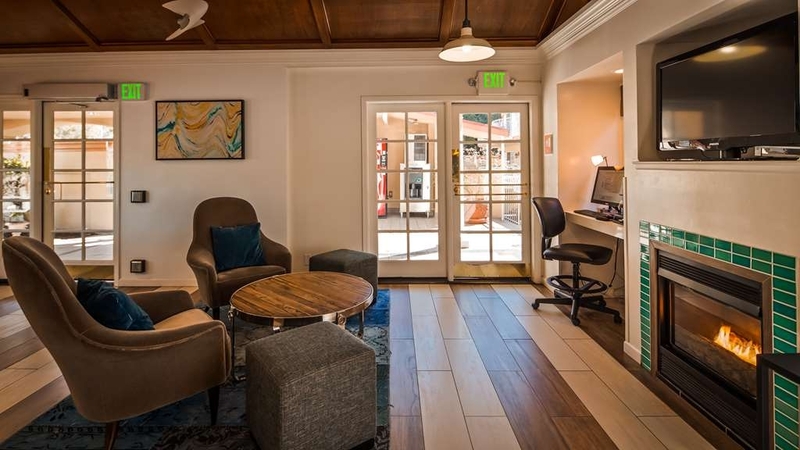 Keeping in mind that this is Silicon Valley this is wonderfully located and the staff here will go out of their way to help make your stay go smoothly. If you want a bargain this whole area is not going to fit your budget but Best Western Plus Riviera goes out of its way to satisfy. "Close to downtown & Stanford"
Close, inexpensive, quality. Staff very helpful. Breakfast awesome, parking easy. Would stay again especially if going to see Stanford. Right down the street. Many close places to eat, mall very close. "Awful hotel experience - stay away!" I want to fair by saying that many of the hotel staff were very kind and helpful. However, there are some serious deficiencies with this property. The room floor was filthy, never even vacuumed properly despite requesting. Hair in tub never cleaned, I watched as one cleaning person took unknown items back and forth to a man waiting in her car in the parking area when she was supposed to be cleaning. The first room we were given had feces in the toilet with the toilet running/broken when we entered the room. The first room we were given had feces in the toilet with the toilet running/broken when we entered the room. They kindly offered another room. The second room floor was filthy, never even vacuumed properly despite requesting. Hair in tub never cleaned, I watched as one cleaning person took unknown items back and forth to a man waiting in her car in the parking area when she was supposed to be cleaning. The sink stopper was broken so water would not drain. We called maintenance and the fix was to remove the stopper completely since they did not have a part to fix it. The rooms are extremely noisy, especially early in the morning due to the hotel sitting right on top of highway 82 (El Camino Real). Many other reviews have pointed this out. We did not mind that much though. They leave earplugs in the rooms. Do yourself a favor and find a better property in the area. Location was good for Stanford Medical Center visit. On El Camino, so there was a lot of noisy traffic. The room was nice & clean upon arrival.Decent breakfast buffet. The comfort of the bed could have been better.The staff was nice enough. Good value for basic stay. This was a nice place to stay while visiting Standford California University. The BW was close to shopping, the university and convenient. Helpful staff, good breakfast. The pool and jacuzzi were nice. There is a small workout room. Each room has a nice balcony table and chairs. "Great service! Staff very friendly and courteous. Great location in Palo Alto. Great value!" Glad we found this hotel so close to Palo Alto and Stanford Shopping Center, Stanford University and Stanford Hospital. We walked to University Avenue and enjoyed a wonderful dinner. Would stay here again! Covers all the basics very well. Friendly, clean, comfortable... safe and convenient location, and a little bit of charm. Great value for us. Our family has used this hotel several times and very happy to return. Great stay and close to Stanford Hospital. Great to have a comfortable sofa in the room. Food available within walking distance. Loved the chocolate chip cookies on arrival. Staff very friendly and helpful! "Stay for appointment at Stanford Hospital"
Great accommodations and great staff. Not luxurious but comfortable and nice. Love the grounds. The location in relation to the hospital are paramount to our picking this hotel. A lack of eating establishments near by is a draw back. "Close to everything but not the greatest service for this money"
The hotel is close to Palo Alto, University ave. and Stanford (walking distance) but the service is not the greatest. While I was there, the sauna was broken although at the check-in they told me that it's working, spa never got cleaned (check the picture) and pool was always in leaves (didn't bother me much, but still). The worst was the service though, there was only 1 girl at the reception who was nice and smiley, the rest seemed very unhappy about something and never said hello or anything else. Another major minus is that it's on a very busy road (El Camino) so I had to use ear plugs to sleep, otherwise it's very noisy. Breakfast is nice though, I especially liked the waffles. "Value for money, ok for a quick stay"
Stayed for 3 nights w hubby and 2 teenage boys. Went for convenience and proximity to Stanford since we will be out anyway we just needed a place to crash after a long day. Appreciate that bfast was included. Though the choices were basic there was an effort to make it balanced and varied each day. The free freshly baked cookies upon our arrival was also a sweet touch plus all day coffee/tea. Signs of hotel's age showed on the exteriors but the seeming new nteriors made it feel bit homey. Surprised to discover that the A/c was located away from the beds and near the sink area which was separate from the shower area. A/C worked well nonetheless. Carpet seemed old and worn and needed serious cleaning. My biggest concern- the hotel was too near the road and we didnt see a security personnel or guard so we were quite concerned about safety and security. Nothing untoward happened thankfully. Some staff were warm and helpful some not. Again this hotel is ok for a quick stay as it provided all the basics. 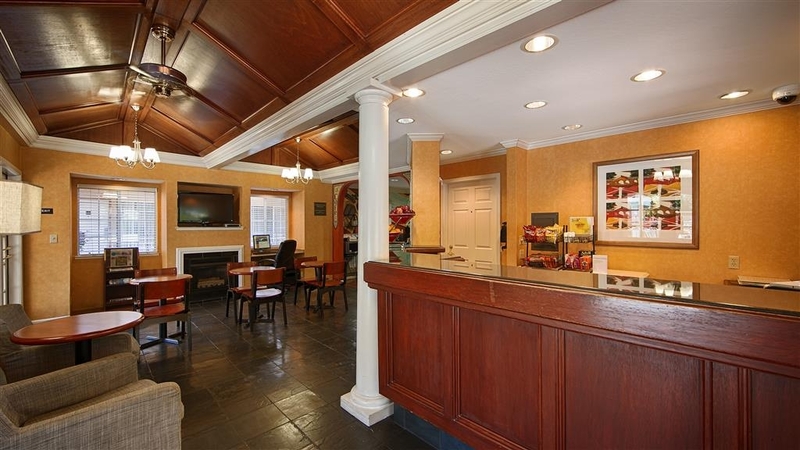 Great stay, nice clean reasonable Hotel, fair Contiental Breakfast, close to shopping center. Great WiFi and cable service. Would recommend to family and friends. Free parking was a plus. Swimming pool was reather small but nice, pool area very clean. "Worst Best Western I've ever stayed at so far!" The staff were rude, unprofessional and unfriendly. The room smelled horrible, the floors were filthy and the maids never changed the sheets after 3 nights; even though I requested clean sheets each day. They told me they didn't even have 1 clean sheet to give me to use over the top of the dirty sheets. The electrical outlets didn't work in the bathroom and they told me they would fix them & they didn't. This made it tougher to get ready on time in the morning for my appointment. The smoke alarm in my room was covered with a shower cap and the room smelled disgusting. When I told the front staff this they shrugged their shoulders and did nothing about it. The pool was closed for the first 2 days even though I was told at the time of booking that it would be open. The traffic noise was terrible all day and night and the parking garage below was unacceptable. The clearance was so low that we hit our heads and the trunk hit the ceiling when we tried to load and unload the car. Overall the hotel was dirty, the breakfast was worse than crappy fast food and the staff were unprofessional at the least. I would never stay here again. This hotel is convenient to Stanford, Stanford Hospital, Stanford Mall and Palo Alto. Parking is easily accessible with no fee. The rooms are clean, the staff helpful, the breakfast is easy and stocked well with lots of variety. Stayed here during a visit to a course at Stanford University. Expensive hotel for the standard, but in the range of similar hotels in the area. Clean and spacious room. The breakfast was very simple. Very close to Stanford Hospital. Short but nice stay. My husband was in the hospital and I needed a nice close place to stay. This was right around the corner. 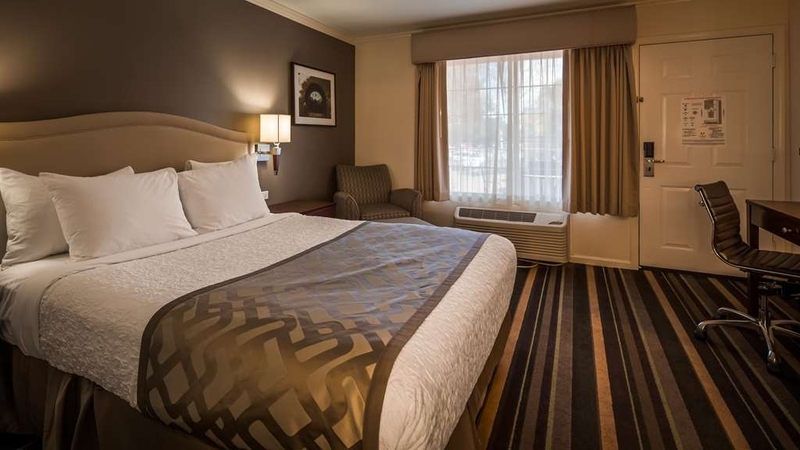 We love Best Western hotels because they always seem to be nice with nice beds. This hotel was very nice and in keeping with Best Western. The breakfast was nice. "Loud Hotel with rude staff"
If you want rude staff to treat you horribly and you want a room where your door don't shut and the staff doesn't care and a crappy night's sleep with a hard bed and nasty overused pillows. stay here. You will have the best night ever. 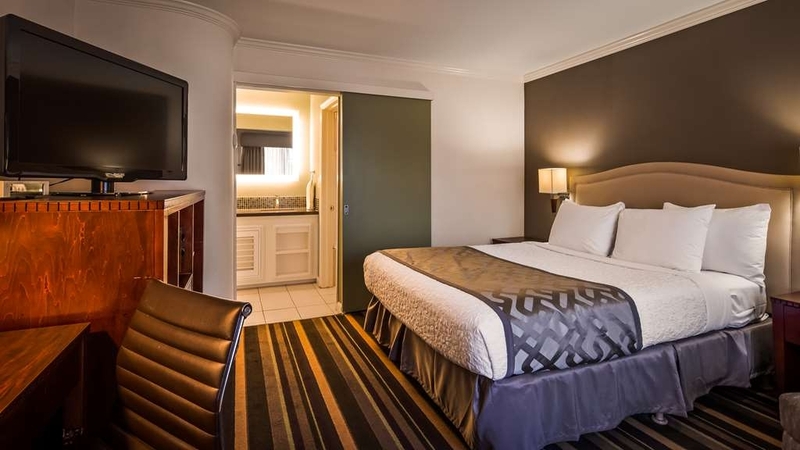 "Easy Uber to Stanford campus"
The hotel is close to Stanford Mall and an easy uber ride to campus. The room was a little tired, but clean enough. The main issue is the noise from the highway and trains that run across the street from the hotel. Nice touch to have ear plugs on the nightstand. Breakfast was great. Good choices and hot coffee. The Stanford Arms hotel is across the street with a full service restaurant and bar. For the price, an Ok stay in this super expensive area. This hotel is close to Stanford Mall. Unfortunately it was noisy on main road and honking often from I believe the Caltrain. Sheets were quite worn, requested a change for other nights and got better ones. Nice choices for breakfast. Free parking. Good safe environment. Would definitely stay here again. Continental breakfast was above expectations. Room was clean and comfortable. Easy to find and close to Stanford and downtown. Staff was very helpful and accommodating. I will stay here again and highly recommend this facility. Room was nice and clean and the bed was comfortable. Rooms are elevated with parking underneath rooms. Hallways are kinda loud when people walk past. Small driveway leading to limited spots and 7 foot clearance. Good location for hotel. Internet worked really well. Dear t y, Thank you for the lovely review and I'm glad that the room and amenities were to your liking. I do apologize for the noise in the hallways and please let our staff know in the future if there is any disturbance or excessive noise within the property. I hope you consider staying with us again in your next visit to the area! Very good service . Located close to Stanford hospital and the mall made it very convenient for us. Staff was very pleasant and helpful. It was good place for the price. I would recommend this place for all practical purposes. Dear 555sujathak, Thank you for taking the time to write a review! Everyday, we strive to create a memorable experience to all our guests with our heart warming guest service and I'm glad we did not fall short of your expectations. 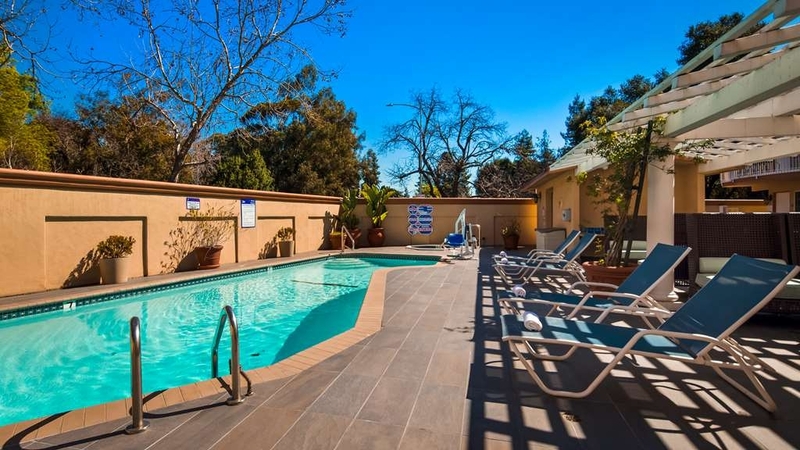 We are lucky to be in an area with a great location and within close proximity to Stanford. Thank you again for letting us know about your stay with us and we hope to see you again! "NOT if you want to sleep." Nice staff, average facilities, but the problem is it is right on El Camino Real which is a 4 four lane highway so there is a lot of traffic noise all night long. I can live/sleep with traffic noise but there is also a TRAIN TRACK CROSSING 100 yards away and the train BLOWS ITS WHISTLE EVERY TIME IT CROSSES, which is about every 13 minutes Maybe it slows down in the middle of the night but it still woke me up six times last night. You decide. 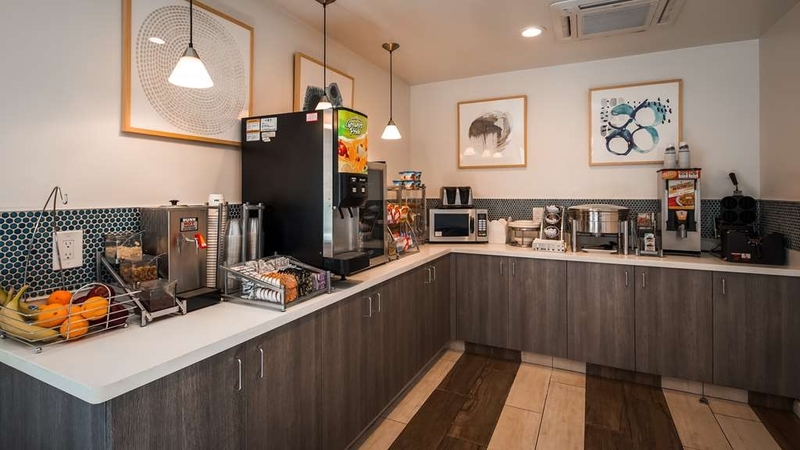 "Great experience during a stressful time"
From the info I gathered, this is the cheapest hotel that is a reasonable walking distance from downtown Palo Alto. Seriously! (It's still absurdly expensive due to the location.) I thought a Best Western would be super basic but it was actually really nice and comfortable, and the hotel staff (all of them!) couldn't have been more helpful or friendly (but not in the over-the-top annoying way). This worked out great for me because I'd come from Australia to find an apartment in Palo Alto and certainly didn't need to be dealing with any hotel problems. Breakfast was sufficient. There were complimentary fresh cookies, which will make me smile any day. I stay here because a family member lives blocks away. 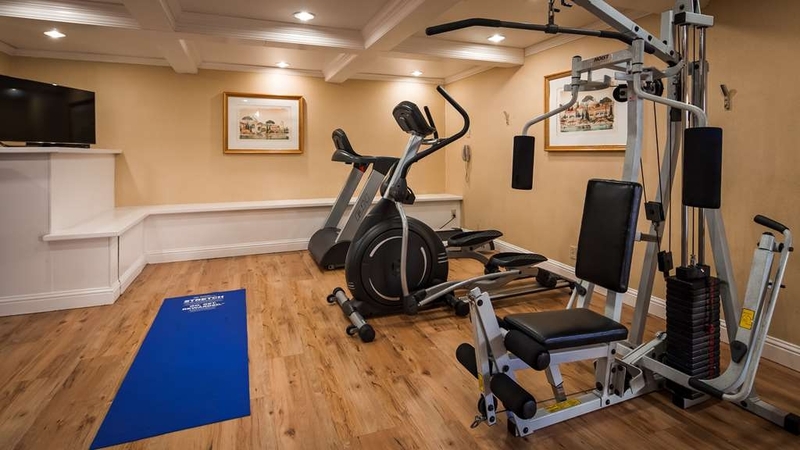 This is a great little facility located near some of the most high end real estate, shopping, Stanford University and tech companies. It is squeezed between major street El Camino and the RR tracks, so there can be some noise, but not excessive. The rooms and lobby/breakfast area have been recently remodeled. The staff is the best - very helpful! There is a good variety of breakfast options. If you need to be in this area, this is a great moderately priced choice. The rates do vary during different days of the week, so check in advance. "Nice Best Western near Palo Alto and Stanford"
This is a nicely updated Best Western located right near the Stanford campus. Rooms are clean and comfortable. Loved the pool! Free parking and internet access. It all makes this a great choice when you need to stay near Palo Alto and Stanford. 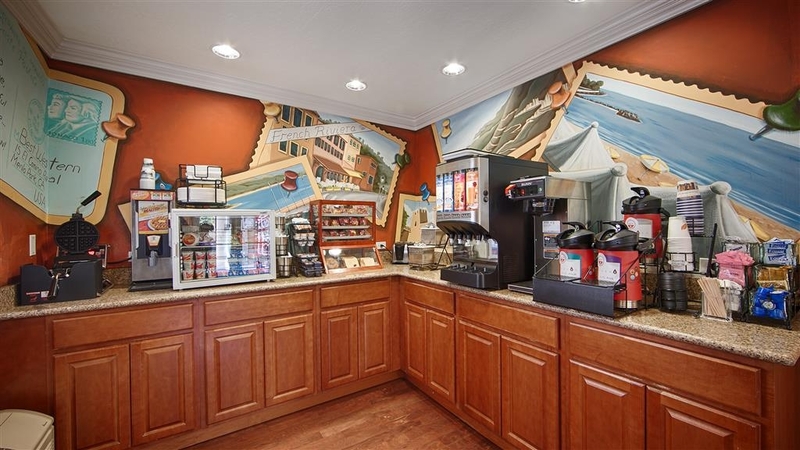 This Best Western was a wonderful discovery and the price was very good. The desk service was friendly and efficient and the motel itself was everything we want when we travel- clean, attractive, affordable and accomodating. We certainly will stay there again when we go to Palo Alto. P. and P. S.
Service was unprofessional and uncaring. Hot water was very disappointing one day with no explanation. Room was left unserviced one day and on another housekeeping forgot to close the door. Stay here at your own risk! "San Francisco - Palo Alto visit"
Convenient location - close to public transit station and shopping centre - did not have time to do shopping even the shopping centre is just next door. Recently renovated property; clean and relative comfortable bed. Good breakfast selection. Will stay again. "Perfectly imperfect home away from home." Yet another lovely visit at the BW Riveria in Menlo Park, so welcoming, so warm, and authentically gracious. Josie remember us at checkin, and was remember us. It feels like it matters that we came back. Extra blanket and extra pillow were fresh and clean.Check out was breeze and that breakfast was fresh and well balanced.It is not post, but it's clean welcoming, and well managed. We love the people and clean comfortable setting. great place to stay when visiting Stanford, just a couple of blocks from the campus. It was also accessible to the 101 freeway, Google, and Apple. The main area of Palo Alto was also just a couple of blocks away. The pool looked inviting, but we did not have the time to go in. Stayed one night for an early appointment at Stanford Medical Center. Very convenient--took less than 10 minutes to drive there. Short walk to Stanford Shopping Center as well. The outside looks pretty dated as far as the design--definitely a 50's/60's style building with outside entry rooms, but they have flowers and little tables outside the rooms and that helps with the atmosphere. Room was small but clean and surprisingly modern given the outside appearance. I would stay again for a night, but for multiple nights would find a roomier place. 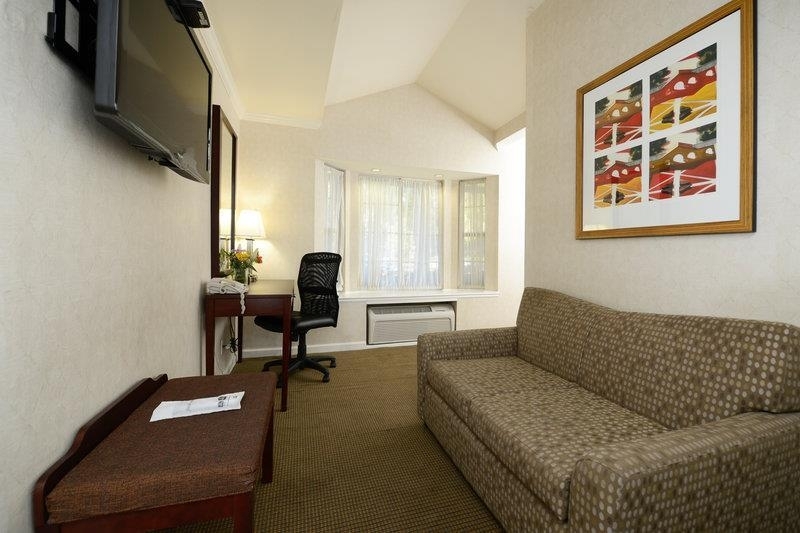 "Great location and a lovely room"
We chose the hotel based on its proximity to Stanford Medical Center. Located directly on a busy street and with a typical 1950 appearance, we didn't know what to expect, but it turned out to be terrific. The rooms are modern, nicely appointed, and very comfortable, with a microwave and a refrigerator, as well as Bath and Body Shop toiletries. 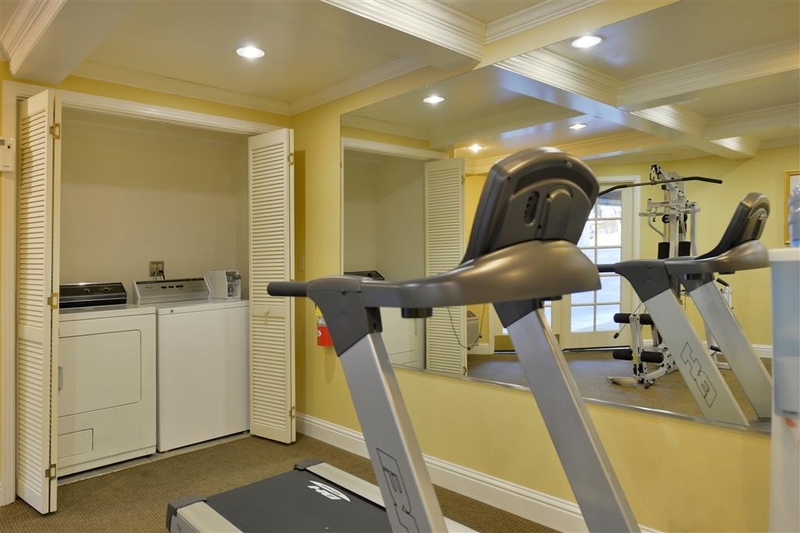 We didn't have a chance to use the fitness room or try the continental breakfast, but both are available. The staff said they are updating the exterior. The hotel is a 20 minute walk to University Avenue where there is a fine selection of shops and restaurants. Some guests might fine the traffic on the street outside and the regional train a bit loud, but we had no trouble sleeping in the comfortable bed. We also greatly appreciated the helpful and professional staff. "Location is excellent, albeit noisy and busy"
"Reliably clean, comfortable, gracious, good location"
This is a well maintained, well managed home away from home. Cookies in the evening, a hot breakfast, lovely staff, and nice attention to detail, make this a nice stay. Close to Stanford, it is not a luxury hotel, it is very reliable, very comfortable, and the thoughtfulness of the staff is beyond compare. I highly recommend a stay here. Very friendly staff and clean, comfortable room. Bathroom was very nice size with big counter. Bed was very comfortable. We were later to breakfast and a lot of stuff was gone but still a good selection. A maintenance worker offered help as I was unpacking the car and refused a tip. He was so helpful and friendly! "Convenient Location Close to Palo Alto"
I rented a bike during my stay. The desk clerk, Kat, did a great job handling drop-off and pickup of the bike and putting me in a room that provided easy access for the bike. She also made sure my room was ready for early check-in. For us, the location was the most important factor. My wife had an 8 am appointment at a Stanford Hospital clinic. I didn't want to fight rush hour traffic to get there on time. The Best Western was less than 2 miles away. The hotel was clean. The free breakfast even had eggs, bacon and waffles, not just rolls and coffee. My only complaint was the sensitive door key card. It took me many tries each time I entered the room.. The hotel is very convenient to Stanford University. It is very clean and reasonable rates. Breakfast is very limited, and breakfast area is quite small. However, there is ample parking space. The staff is very helpful. "Comfortable bed; good location, good breakfast"
The beds are very comfortable. I especially loved the breakfasts on Wednesday and Saturday. Very easy to uber to/from too. This was my second time staying; and I am sure I will stay at the same place again when I come back down to the Bay Area. People go to hotels to get a good nights sleep and when you walk into the room for the first time and see that the beds sag in the middle, you realize you are not going to get a good nights sleep. Notified the front desk and all they said was they would make a note of it and apologized. Beds should never have gotten to the condition they were in when we arrived. "If you have family at Stanford- best place to stay"
I have had 2 different family members have to stay a week at Stanford Hospital. Both times I have stayed at Best Western Plus Riviera. Clean, very close to the hospital, friendly staff and they offer a discount if you have someone at the hospital. 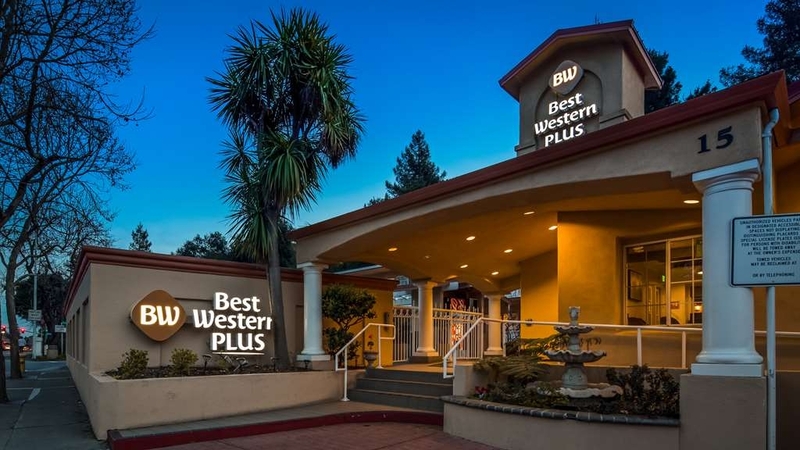 If I ever have to go again, I will return to Best Western Plus Riviera Menlo Park! The friendly staff took my request into account for breakfast options safe for someone with celiac. They provided me with multiple safe and tasty options for my breakfast! Rooms were clean, check out and check in were easy and fast. "not that noisy with earplugs"
As mentioned in many other reviews, the rooms are too close to the road and railway so it could be noisy. It was the case that you could hear the train late at midnight or so. Admittedly I would have a poor sleep in such an environment, but with the provided earplugs I was able to sleep sound and tight. It is about 8-min walk from the Caltrain station -- a bit inconvenient if you don't have luggage. Otherwise it is fine. 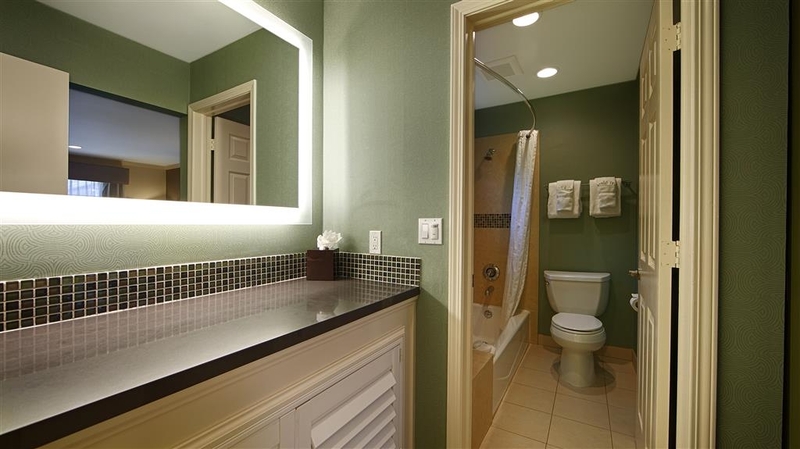 "Nice Choice in Menlo Park"
We stay here because we can walk to my Aunt's house easily. That being said, it is a well kept facility with much recently remodeled. There is a good continental breakfast, and the rooms are nice. It is located between Camino Real and the RR tracks, so you will hear some noise but not excessive. The staff is well informed and helpful. There is a big difference in price between weekends and days - check several dates if you are flexible. "Yours is a very, very bad hotel for business travelers"
I had my first (and last) stay at the Best Western. I work for a well-known nearby tech company, and am frequently on business travel in the SF Bay Area. The Best Western is simply the worst hotel I have ever stayed at on business in the Bay Area. I unconditionally disrecommend it for business travelers, as do nearly all of my colleagues who have stayed there. It is astonishing that anyone can charge $250/night for such a hotel. * NOISE - The rooms are so noisy that Best Western literally provides earplugs. I've stayed at several other hotels on El Camino Real and near Caltrain. I've never seen any remotely this noisy before. Simply put, this hotel isn't noisy because of its location -- but because it appears to have single-paned windows and insufficient soundproofing. I came to work nearly every day tired and sleep-deprived -- the opposite of what you go to a business hotel for. * ONGOING CONSTRUCTION - When I came home on my third night, my hotel room absolutely reeked of an acrylic fume, like rubber cement. The smell was so strong that the hotel room was effectively uninhabitable. After conversation, the only hotel staff member on duty moved me to a room that was technically under construction. When I woke up in the morning, all of my clothing continued to reek of the pungent acrylic fumes. When I asked if they could find a way to clean my clothing before I left for work in 2 hours, they pointed me to a coin-operated machine that I could pay my own money for to remove the hotel's fumes. (It also didn't occur to their hotel front desk person - who never smiled - that as a business traveler, I might not be carrying several dollars in quarters around.) I ended up buying new clothing to wear for the day. I also e-mailed the manager to ask for the hotel to intervene and make it right. I did not receive a reply. If you are in Silicon Valley on business, do not try to save money staying here. Your time and sanity are too valuable. Each Thanksgiving I travel to Palo Alto and stay across the city border in Menlo Park at this hotel. 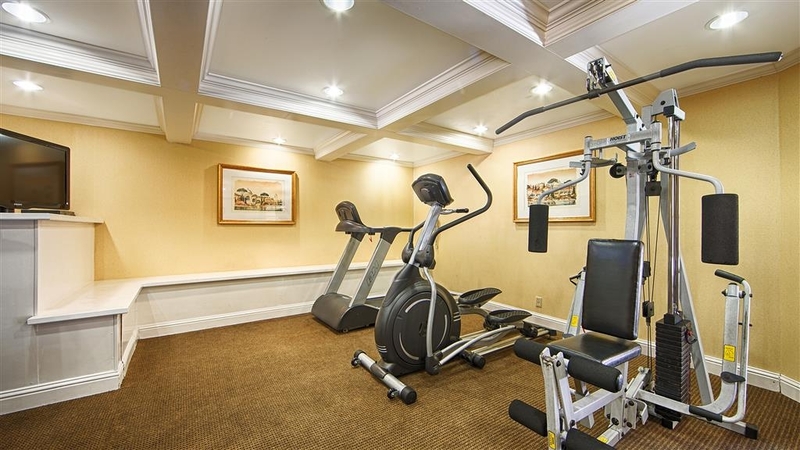 It is a short walk to downtown Palo Alto from El Camino Real. The hotel is clean and well maintained. (They were painting railings during this visit.) There is a lot of highway noise and noise from a nearby commuter train. Overall it is a good place to sleep while visiting Palo Alto but not a destination in itself. 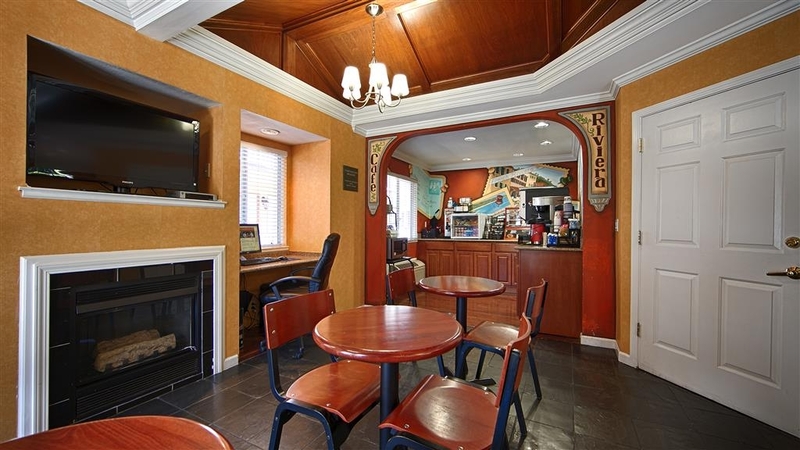 The Best Western Riviera Motel in Menlo Park was comfortable and quiet. The room served our needs perfectly. Staff was outstanding for check-in and check-out...no complaints. The breakfast would have been nice, but did not fit in with our family gathering on this Thanksgiving celebration. Parking was easy. We stayed here in order to be close to Stanford campus. Indeed, we could walk across the shopping center and be on campus or drive a short distance to be there. This hotel is clean and comfortable. We had one of the rooms closest to the road and yet the road noise was not at all bothersome. The staff was very friendly and helpful. The breakfasts were sparse but adequate. In summery, this hotel is pricey, but for the great location, it was worth it. We were in Palo Alto for medical reasons which required a place to stay near Stanford Hospital for two nights. The staff was very professional and accommodating to our needs. The rooms were clean with all the necessary amenities. Unless you are really desperate (ie no other possible options), I would strongly discourage staying here. I/my company paid over 300/night, and I certainly expected more than a roadside motel with the doors to each room opening to the outside, and literally less than 25 yards from a busy/loud road. Traffic starts at 530. So be prepared to use the earplugs provided on each bedside table. The only reason for 2 stars vs 1 star is that it's close to Stanford. Otherwise, I feel certain that no one in their right mind would choose to stay here. "Nothing great for the price"
I stayed here one night because It was close to Stanford Medical. I didn't check in til Midnight, exhausted from a long day and found the room to be dirty. Mostly the bathroom which had long black hair in the shower and at least 20-30 hairs on the bathroom floor. I called the front desk and she apologized and asked if she could bring some towels to lay on the floor. I told her no I will do it myself. I was too tired to wait for someone to come. She said there were no rooms available to transfer to. I woke at 6am to check out and when I mentioned it to the person at the front desk she said that they have been having problems with hiring housekeepers and had hired an outside service to do it but they aren't doing a good job. They didn't offer any discounts and I paid 240.00 for the night which supposedly is the hospital discount!! It is obvious that they don't have anyone doing quality control. Good location but I chose to stay elsewhere the next night.